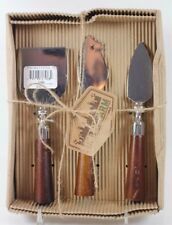 THIRSTRYSTONE 3 PIECE CHEESE SET WOOD HANDLE KNIFE SPREADERS URBAN FARM, NEW! With handles of Sheesham wood and stainless steel blades, each piece is designed to cut or spread cheeses of varying hardness, for maximum versatility. New, Thirstystone N342-Multicolor Urban Farm 3 Piece Cheese Set/Sheesham Wood Handles! Pearl Handled 2 Piece Cake Knife & Server by Thirstystone. NEW! Includes a silver cake knife and server with graceful, delicate and intricate pearl design on both handles. 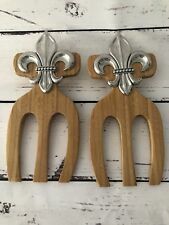 Cake Server is 9.44"L by 2.36"W.
This is a pretty set of two salad serving "hands" in a Fleur de Lis pattern by Thirstystone. They are bamboo wood. They are in excellent condition with no scratches. Just need a little cleaning. I think they may have been used for display. Thirstystone Urban Farm. 3 Piece Cheese Knife Set. Product Type: Spreader. Wipe with a warm, damp cloth. Primary Material: Wood Flatware. Adds glamour to any setting with gold tone. Handle Pattern: Gold Accent. Overall Product Weight: 0.287 lbs. 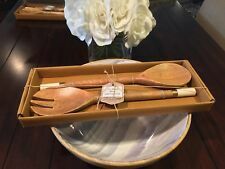 Thirstystone Mango Wood Salad Server Set. Includes Server Spoon & Fork. Hand Wash Only. 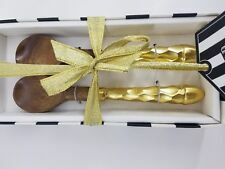 Thirstystone David Tutera's Old Hollywood Cheese Tools, New in Box. Great Gift!! Thirstystone puts the accent on elegance with this sleek set of cheese tools, finished in matte gold-tone and designed for hard and soft cheeses. New, never out of the box. Great gift idea. Set includes 3 tools: each approx. 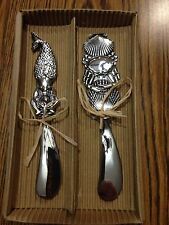 Thirstystone Decorative Spreaders Set of 2. I may not know what is VITAL info to a serious collector. Silver Owls. 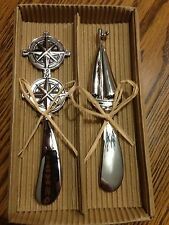 THIRSTYSTONE PEWTER STAINLESS STEEL TOPPED SPREADERS 4 PIECES GIFT SET “ WINE NOT “. Made out of zinc alloy construction for lasting quality and the decorative icons on top are made out of pewter. You will receive one of each Wine Not?. Handles engraved with "Live the Life you Love" adds an authentic look. 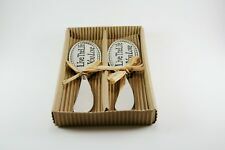 Ideal for cheese lovers, it can also serve as a perfect gift or added to a gift basket. Containsa two decorative cheese spreader. 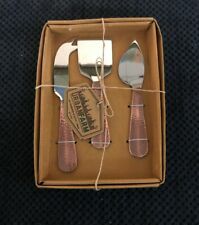 NIB Thirstystone 2 piece stamped stainless steel, brass with satin antique silver finish Salad Serving Set. Super cute salad tong set. Bamboo with silver fleur-de-lis. Mango wood/resin; Iron with copper-tone finish. Set includes 2 servers: 12.75" x 3" x. 75" each. Thirstystone Cooper 3- Pc Cheese Serving Set New With Tags. Condition is New. Shipped with USPS Priority Mail. Thirstystone N177 Cheese Spreaders, Ladybug. Publisher: Thirstystone. Label: Thirstystone. Available in sets of 2 or 4, there is a set of Thirsty stone Spreaders for every occasion. Set of Two Spreaders. These would be perfect for the beach house on that cabin near the lake when your entertaining on the deck or patio. These would be perfect for the beach house on that cabin near the lake when your entertaining on the deck or patio. You get one sailboat and one compass knife/spreader. David Tutera's. Set of 2 Spreaders. Old Hollywood. 5.25" l ong x 1.5" wide. No dishwasher or microwave. Thirsty stone Spreaders are the perfectly accessory for your next party or get together. Available in sets of 2 or 4, there is a set of Thirsty stone Spreaders for every occasion. Set of Two Spreaders. Item model number: N166. Manufacturer: Thirstystone. Thirsty stone Spreaders are the perfectly accessory for your next party or get together. Available in sets of 2 or 4, there is a set of Thirsty stone Spreaders for every occasion. Dishwasher safe. Material: brass. Made in India. Dishwasher safe Material: brass Made in India. 4 Piece Stamped Spreader Set. If there’s a problem, just let us know and we fix it. Make sure this fits.